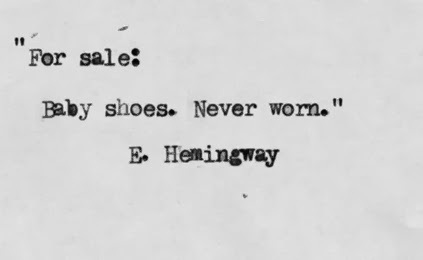 They say that Ernest Hemingway won a bet in a bar when challenged to write a six-word memoir (some versions of the story add "that would make people cry"). His answer? "For sale: Baby shoes. Never worn." You'd think that would be enough to make everyone else give up, but no. (He was, according to Fast Company, a productive badass in six different ways.) Thanks, perhaps, to the age of Twitter, limited word-count storytelling is seeing something of a renaissance, with new variations, options and challenges aplenty. One sentence, six words: The Race Card Project, created by NPR's Michele Norris, sticks with six words, but requires you to keep them all in one sentence while answering the question "How would you distill your thoughts, experiences or observations about race into one sentence that only has six words? The project has an empty Twitter account, but you'll see the vitality of this as a social media sharing project by following the Twitter hashtag #racecardproject to see examples. Five sentences: Spine is an app that lets you create or collect five-sentence stories. Some call it a social network for poets, although your entries don't need to be poetic. One more word: Brain Pickings blog summarizes the seven-word autobiographies of famous artists, culled from the exercise they're put through when participating at the New York Public Library's interview series: The interviewee is asked for the seven words to serve as her introduction, a clever use. Can you make your bio into a six-word summary of you? Challenge the speakers on your next panel to do so? Thank you. Thank you very much: We might blame Elvis for the five-word thank you, but the Webby Awards have institutionalized the process, limiting all acceptance speeches to just five words. Read the archive here to get ideas for your own next thank you speech. Six words as writing prompt: Writer.ly, an online marketplace of services for the self-published writer, shared this six-word writing prompt--appropriately, on Twitter. Could you do this?